Ready to create a KioWare for Windows Addin? 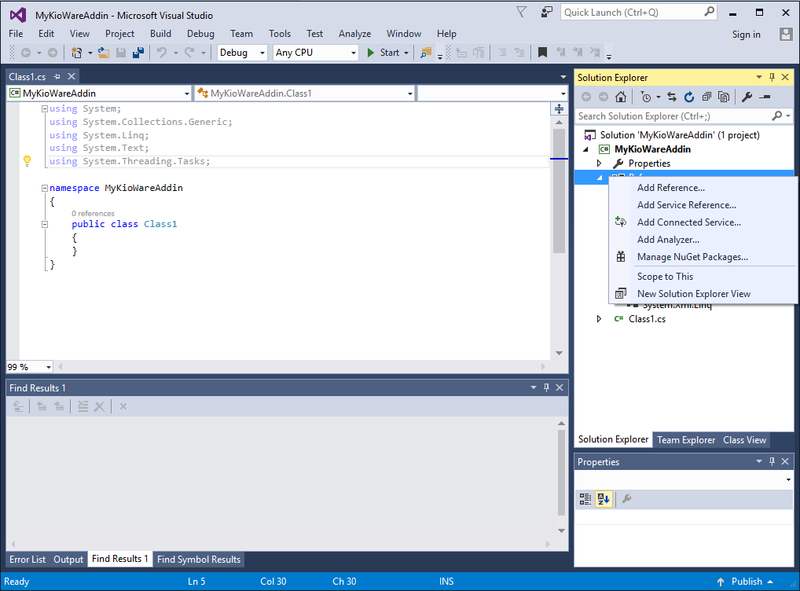 You'll need Visual Studio to get started. Next, you need to add a reference to the KioWare library KioWareClientSharedLib.dll. To do this, right click on the project, and select "Add Reference..." from the context menu. Next, we'll drop in a 'using' statement at the top of the code. We want our new class to derive from IKioWareAddin. To derive from another class, add : IKioWareAddin after your class name. Hover over IKioWareAddin, click on the light bulb to see more options, and select the "Implement Interface" option. In the Name property, add code to return the new addin's name. Under the "Tools" menu, select "Create Guid" to open the GUID creation utility. Select "4. Registry Format", and click the "Copy" button to copy the new GUID to the clipboard. You should generate your own GUID, and not use the one generated in this example. In the UniqueID property, add code to return the new addin's GUID. Paste the new GUID into the code. In the Version property, add code to return the new addin's version. In this example, we'll use 1.0.0.0. Implement the Load function by storing the host instance into a new private variable (for later use). The host instance will provide you with multiple ways to tie into the KioWare engine, so you'll likely need this reference at some point, and this is the only opportunity to get it. Implement the UnLoad function by setting the host instance reference to null. Open the project properties window by right-clicking on the project in the solution explorer menu, and going to properties. if NOT EXIST "%dir%" mkdir "%dir%"
Your addin should now load with the next launch of KioWare.